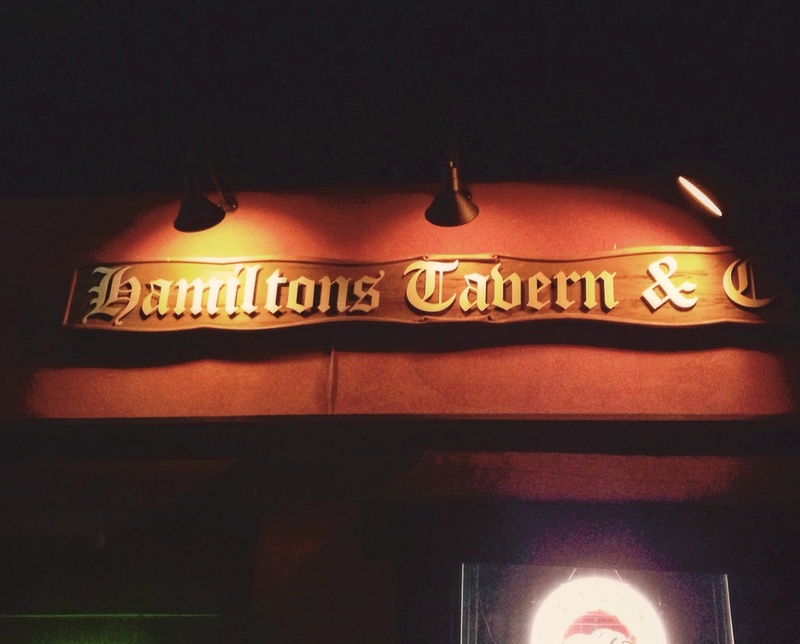 Hamilton’s Tavern is located at 1521 30th Street, a spot that’s been licensed to sell beer and wine for over 75 years, making it the oldest place to down a cold one in San Diego. In a city that’s changed a lot (witness the Gaslamp district’s Disney-esque makeover), Hamilton’s is a rarity: a local watering hole with a long history. I asked the older couple next to me what makes this place so special? “It’s the quintessential neighborhood bar. We come here all the time.” The place had a way of keeping you - I walked in for one beer, then spent five hours drinking IPAs, talking, laughing, and watching spectacularly bad movies (Cowboys versus Dinosaurs, anyone?) in this bastion of craft brews. Do all taps go to heaven? The first thing you notice about Hamilton’s is beer. Everyone’s drinking it, there are 24 fresh drafts and dozens of bottles from Belgium, France, and more. The chalkboard list sounds like undergrad coursework: Natura Morta, Jacobin’s Rouge, Pliny the Elder. When you look up, you see that more than a hundred taps are suspended from the ceiling, reminding us that all beers go to heaven, or maybe just send imbibers there until morning. The bar is dark in a conspiratorial way. People linger at scuffed hightops, play at well-used pool tables, or feed the jukebox to hear metal, new wave, and grunge hits from another time. When I settled onto a bar stool, Brian, a tall, bearded, genial 20-something, was ready to help me fulfill my goal of drinking local. He brought me a series of tastes, and after five - including a stout and a Zwickle - I decided upon The Pupil from Societe Brewing Company, which had bright grapefruit flavor. I ordered one of the famous cheese melt sandwiches – a Rip Taylor, a cultural reference older than everyone in the bar. With pulled chicken, biting red onions, melted provolone and pesto on grilled sourdough – it was a fantastic meal, and a delicious excuse to order my next beer, the Stone "Enjoy by 4/20/16" – a beer with an emphasis on freshness. The crowd really was mostly locals, despite the fact that Hamilton’s sits right on “Beer Boulevard” of 30th Street. This avenue has a host of breweries and beer-focused bars, and it’s truly a great destination within this city that’s famous for its craft beer scene. Among the locals were a boxer and Chihuahua to my left and two gregarious Mexican American friends to my right. Fernando and Claudia were talkative and fun; soon we were sipping each other’s beers and laughing at Dave Chappelle’s antics in Half Baked. “You’ve never seen this movie?” Fernando asked. No, but it was great to share it with new friends here. Now that I had accomplices, I had to order another, and this time it was the Hop Concept’s Comet and Galaxy, a full flavored, complex beer with citrus flavors. I tried to stick with San Diego beer, but in the end, I had to pay homage to the most award winning IPA around, Pliny the Elder from the Russian River Brewing Company. Beer Advocate gave it a perfect score. Everyone around me had been ordering it, and when my glass arrived, I was not disappointed. It was truly delicious – refreshing, hoppy, fruity with a nice bitter finish. When it was pushing 2:00 a.m., a bartender with a braid that dangled down his full back rang the brass bell to announce last call. We finished our beers, then walked into the mild night with the other stragglers. Claudia invited me to join them at her place to drink one more for the road. We sat in her studio apartment, toasting new friendship, looking at her art, talking about life, taking selfies, and listening to vinyl. An hour later, I summoned an Uber and went back to my hotel, full of happy memories from my night drinking local with the locals at Hamilton’s.